Yup. We did a double-take and cringe when we saw this mask too. The good news is that it's terrifying. That's usually what people want in a good scary mask, right? Something crazy and haunting? Something that makes you want to stare, but also makes you want to bolt it out of there so fast you'd be a blur? We understand. So here we have our Fatty Hamskins Latex Mask. 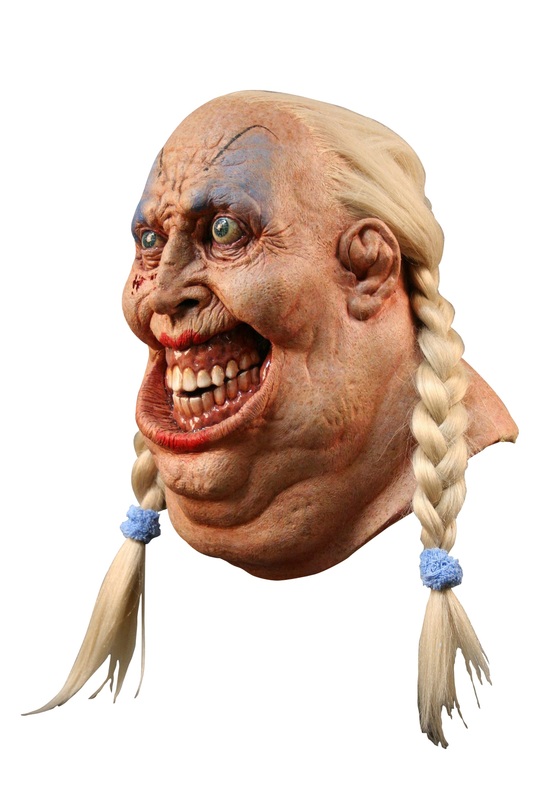 With some grotesque sunken eyes, gaudy blue eye shadow, extra chins, stretched maw, and blonde pigtails, this accessory is every bit the hideous mask you're looking for. Whether it's being worn as a carnival freak, a psychotic girl from the bayou, a cannibalistic grandma (or whatever other terrifying backgrounds you can think of), Fatty Hamskins has got you covered. Now if you'll purchase it already, we won't have to keep looking at it *shudder*.